There is nothing better than a perfectly styled bookshelf, let me tell y'all. It's probably one of my favorite parts about an install day. You never really know what you're dealing with until the end. When you design a house from start to finish, you pick everything, from finishes to furniture. 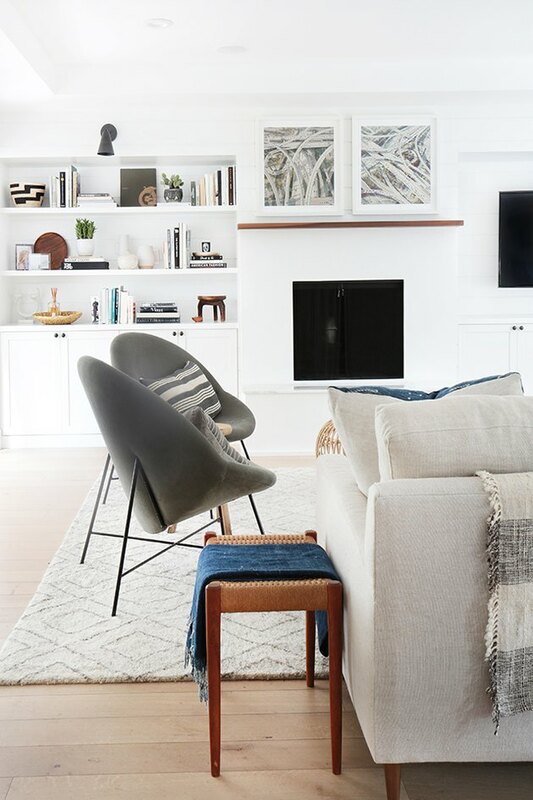 All of this comes together in a designer's mind and they are able to envision what the home will look and feel like at the end of the process. You just can't do this with bookcase styling, or any styling for that matter. You just have to dive right in, shop around for extra knickknacks day of, and mindfully place things until they're damn near perfect. I'm sure I made that sound super easy and very obscure, but don't worry that's why I'm writing this article! 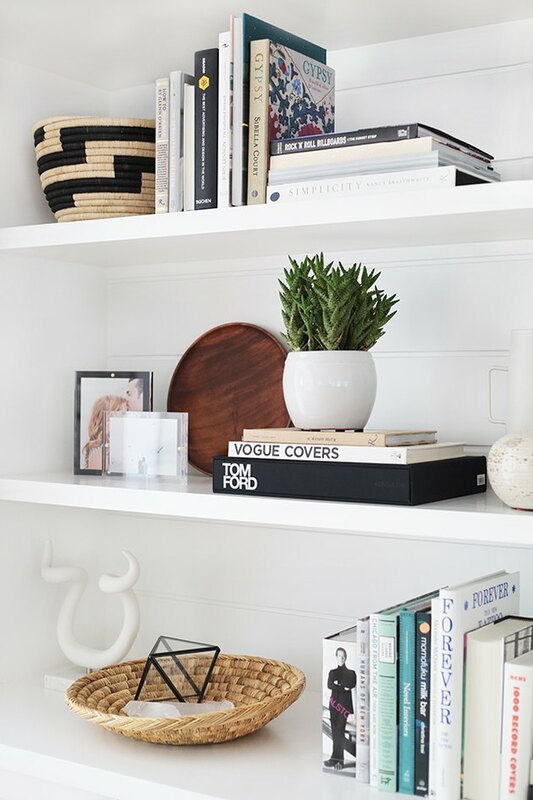 I'm going to tell you exactly how to style your bookcase, so here it goes. 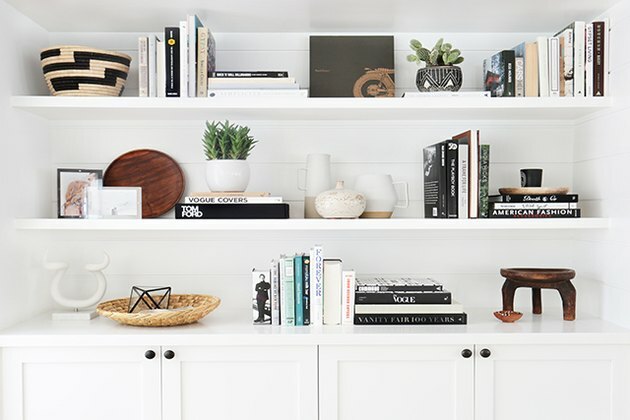 Before you start styling, paint your bookcase white. I love white, you love white, everyone loves white, and it's the perfect backdrop to display anything on. The first step should be pretty obvious, but go through all your books and make a KEEP stack and a STASH stack. This is like spring cleaning for your book collection. If you're keeping old textbooks from college, please stop trying to relive your glory days and stash 'em. I'll only accept a few yearbooks that your crush wrote in back in the day, got it? 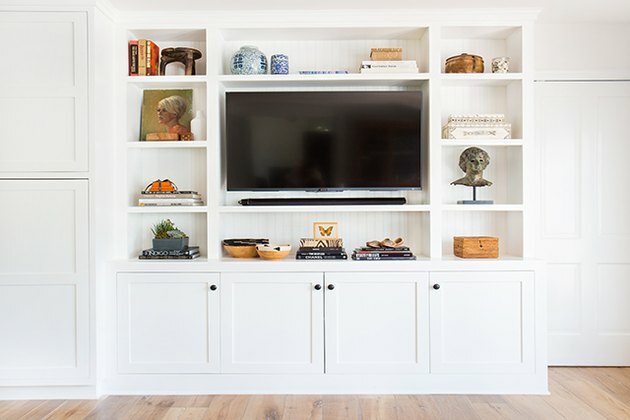 Remember, interesting bookcases don't just include books, so do the same for picture frames, keepsakes, and knickknacks too. Gather up things you'd like to keep on display that have importance in your life. Ideally, these pieces are good conversation pieces for your guests to point out and ask the story behind. Just a little rule of thumb: Do not include items smaller than an apple — they'll just clutter and crowd. Next, I'd like you to divide books up by subject and/or color. I mostly go by what looks best so pay special attention to the spine, since this is what's on display. Here's a good tip: If you don't like the book jacket, then take it off and see what's underneath! The book jacket could be hideous but you can definitely still use a muted book in its place. Next, lean or stack your books, and feel free to alternate from left to right on each shelf. Place books in places until it feels balanced when you step back. I generally like to place books vertically and then use a stack of books as a bookend. 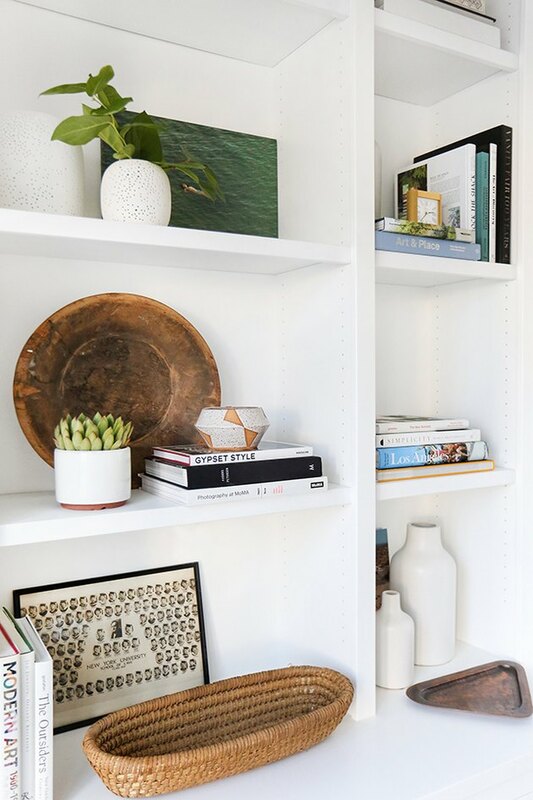 Once you have your books placed, scatter your belongings on each shelf — a candle here, a cacti there, whatever feels right. I love it when clients have vintage art pieces that we can prop behind a plant and such. Just combine a bunch of interesting touches, so your eye is able to move easily throughout. Also, lining up your picture frames is a thing of the past. Instead of putting them all out in one spot, sprinkle them throughout. When I see a bunch of stacked picture frames on display, I go a little crazy — it's just too much to look at in one area. We don't style it perfectly on the first try, which means you don't have to either. 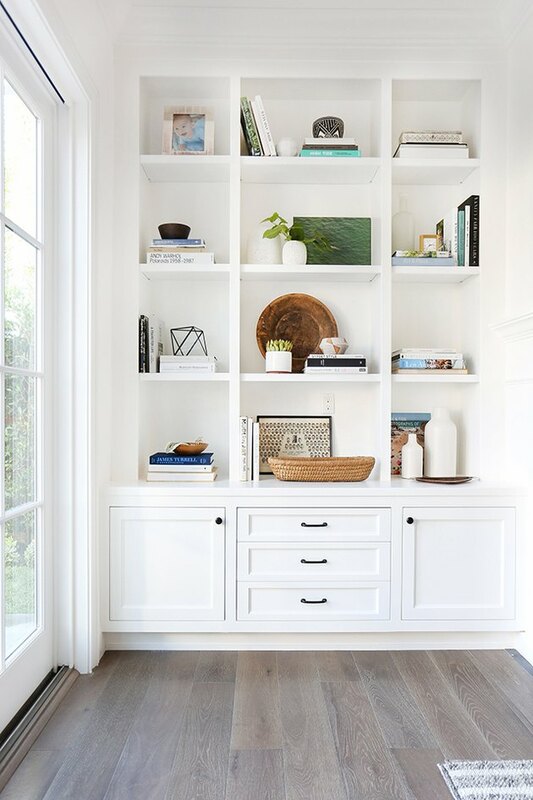 I could spend hours on end making the tiniest of changes, but hopefully, you all don't go into the loony bin after trying to style a bookcase in your own home — ha! Simply, stand back and move things around — then stand back again — and edit again, and maybe even again! If you're sick of looking, then pick back up on it another day. 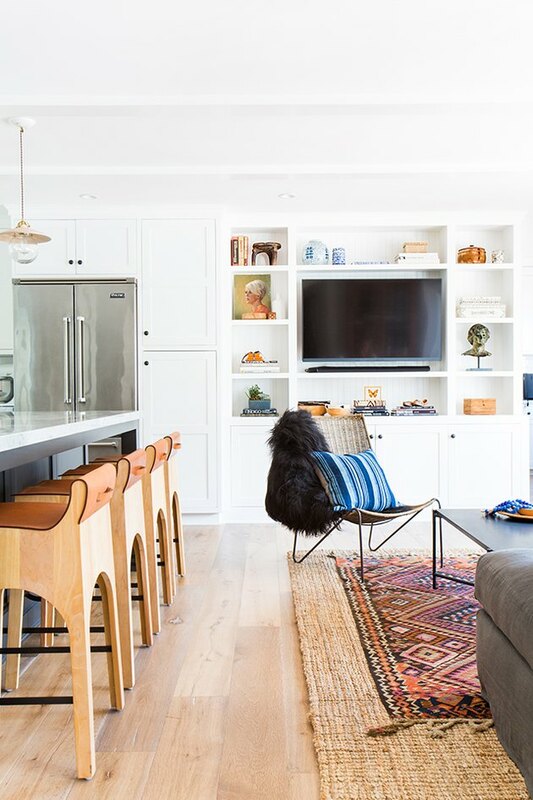 The best part about your own home is there's no deadline — you're your own client! Remember, there's beauty in simplicity people! It's important to trust yourself and know when it's done. In the end, you should have a bookcase that draws your eye throughout and creates interest. It's also a major plus if it looks nice, but that's the dang goal here, so it better! 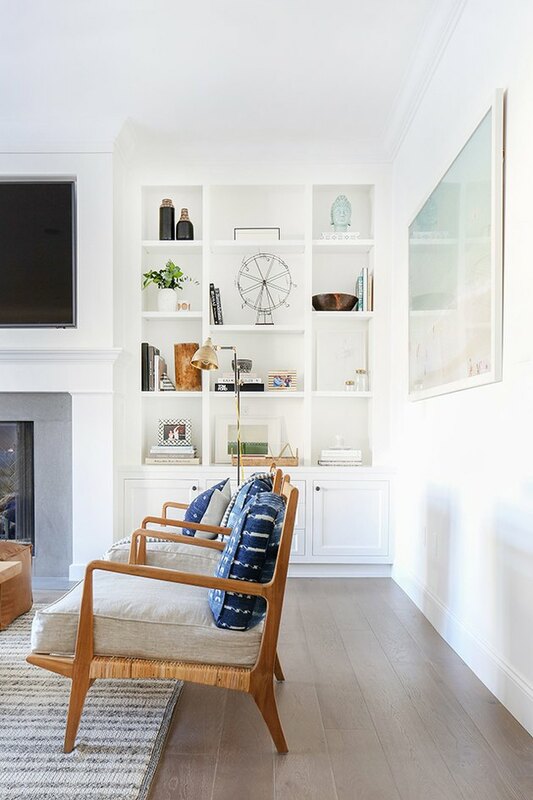 I hope you can look at my clients' perfectly styled bookcases and gain all the inspiration you need to style your own. Think of it as a math equation, utilize the steps and tips I gave you, and in the end, I promise you'll be happy with your outcome. Remember, don't stress yourself out and over think it — it's only a bookcase!